Heraldry on the first page of the Psalms text strongly suggests that this Psalter was commissioned by King Edward I for the marriage of his son Alphonso, to Margaret, daughter of Florent V, Count of Holland, which was to take place in 1284. Alphonso died before the wedding, however, and the decoration of the manuscript was left incomplete. Additions were made in the early 14th century, probably before 1316. Sts. Andrew and Lawrence are identifiable by their traditional attributes, the instruments by which they were martyred: the X-shaped cross on which Andrew was crucified, and the grid-iron on which Lawrence was roasted. 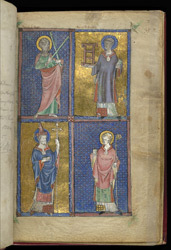 The identification of the lower two saints is uncertain: the first may be St. Peter, since he has a unusual head-dress, which may be intended to represent a papal tiara, but he does not carry his usual attribute, the keys to the gates of heaven. The last figure has been identified as St. Martin, but all that can be said with certainty is that he holds an abbot's staff or bishop's crosier.